Yesterday afternoon (17th September, 2014) I headed over to Mount Lofty summit, VK5/ SE-005, which is located within the Cleland Conservation Park. I had already activated this summit earlier in the year on two occasions, so there were no Summits on the Air (SOTA) activation points up for grabs for me. But I could earn 1 point for the VK5 National and Conservation Parks Award. My main motivation for heading to the summit was that I had seen a number of alerts on SOTA Watch for that afternoon, from activators in the United Kindgom and Europe, and I was hoping to make some ‘summit to summit’ contacts. However, the weather was a bit ‘iffy’. We had received a large amount of rain overnight and early in the morning here in the Mount Lofty Ranges, and it was still drizzling after lunch. So I toyed with the idea of cancelling the activation. About an hour out from the activation, I jumped onto the weather bureau website and saw that the weather was supposed to clear up. So, with a degree of hesitation, I prepared the gear and loaded my equipment into the car, and headed towards Mount Lofty, which is just a short 15 minute drive from home. For this activation, I decided to set up in a different spot as opposed to my previous activations. I normally set up my station on the eastern side of the summit away from the tourists at the lookout and the restaurant. Mount Lofty offers spectacular views of the city of Adelaide, so the summit is generally quite busy. But this time I headed very close to the summit obelisk, and set up my antenna a short distance from the Country Fire Service fire spotting tower. This was to be a big mistake! Because I had driven into the activation zone, I had to walk out of the activation zone and back in again with all of my gear. Not easy work, considering I hard brought along the Yaesu FT-450 and my 44 amp hour power pack, so that I could run a bit of extra power (40 watts on 40m and about 60 watts on 20m). And the fact that I had put on a fair bit of weight during my recent trip to Europe. Fortunately there was a track leading down towards Waterfall Gully. So I walked down the track, and slowly, slowly walked back up the track to my operating position. I took some minutes of well earned rest, under the watchful eye of some visitors to the restaurant, above me. This location was a little more of a challenge in setting up the station. My operating spot was on a slope which had a lot of fallen branches and rocks. I secured the 7 metre squid pole to a fallen tree stump, which I also used as a seat and a bench for the radio. I had some issues with the bottom cap of the squid pole coming apart, resulting in the squid pole de-telescoping. Time for some running repairs. And then with the squid pole falling down in the breeze, so I propped it up with a large rock. Not a great start to the activation! Upon turning on the radio, there was quite a bit of noise on the 40m band. A lot more than I normally hear at Mount Lofty. Obviously emanating from the nearby tower with its array of communications equipment. My nominated frequency of 7.090 was impossible to work on. There was simply too much noise. Strike two! So I headed up to 7.095 after sending out an SMS message to some of the keen park hunters here in VK5. My first contact was with Larry VK5LY in Renmark who had a very strong 5/9 plus signal. This was followed by Col VK5HCF in Mount Gambier who was also 5/9. My third contact was a bit of a surprise. I was contacted by Colin VK4FAAS who had a good 5/6 signal coming down from Brisbane in Queensland. My fourth contact was with regular park hunter, Brian VK5FMID, also located down in Mount Gambier. 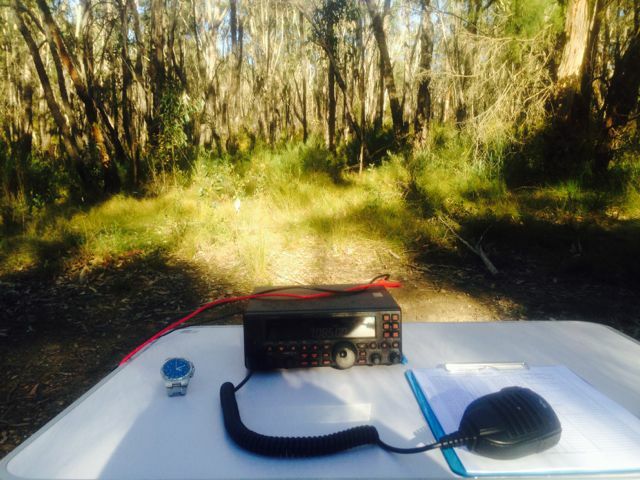 Conditions on 40m appeared good, but not as good as they were on the weekend when signals were incredibly strong. The noise floor was certainly not enjoyable either. And the fallen log was not the most comfortable. But I pressed on, and made a further 10 contacts on 40m SSB into VK3, VK5, and VK7. I did note that there was not the normal pile up, most likely due to it being a week day. After the first 7 contacts on 40m, I had to QSY up to 7.098, due to the Kandos Net on 7.093. After working Peter VK3FPSR, the SOTA Goat application on my i-phone bleated, alerting me to the fact that Mike 2E0YYY was now on 20m on a summit in England. So with no further takers on 40m, I lowered the squid pole and took out the crocodile clip links and then re-erected the squid pole. I changed bands to 20m, but was greeted with noise, noise, and more noise. Much worse than 40m. It was clear that I had to change locations. Strike three, but not quite out! So, with a fair degree of frustration, I quickly took down the antenna, and lugged the equipment back to the car and drove a short distance away to the eastern side of the summit. Where again, I had to walk out and walk back into the activation zone with all the heavy gear. By the time I got back to my operating spot, I was exhausted. I layed down on the ground to recuperate, only to be approached by a bushwalker to make sure I was still alive. After re-erecting the antenna, I tuned to 14.333 and heard Mike 2E0YYY calling CQ from SOTA peak, Shining Tor, G/ SP-004. Mike was not as strong as I normally hear him at home. However he still had a good 5/5 signal and pleasingly, the noise floor here at the new location, had dramatically dropped. Although it was noisier than usual. I called Mike and received a 5/7 signal report from him. I was very excited to get a summit to summit (S2S) in the UK. Although I have worked a lot of DX from summits, I have not worked anywhere near the number of DX S2S contacts that some of the other Australian SOTA activators have. I sas Barry M0IML also spotted on SOTAWatch and I tuned to Barry’s frequency, but his signal was a little too low to work. 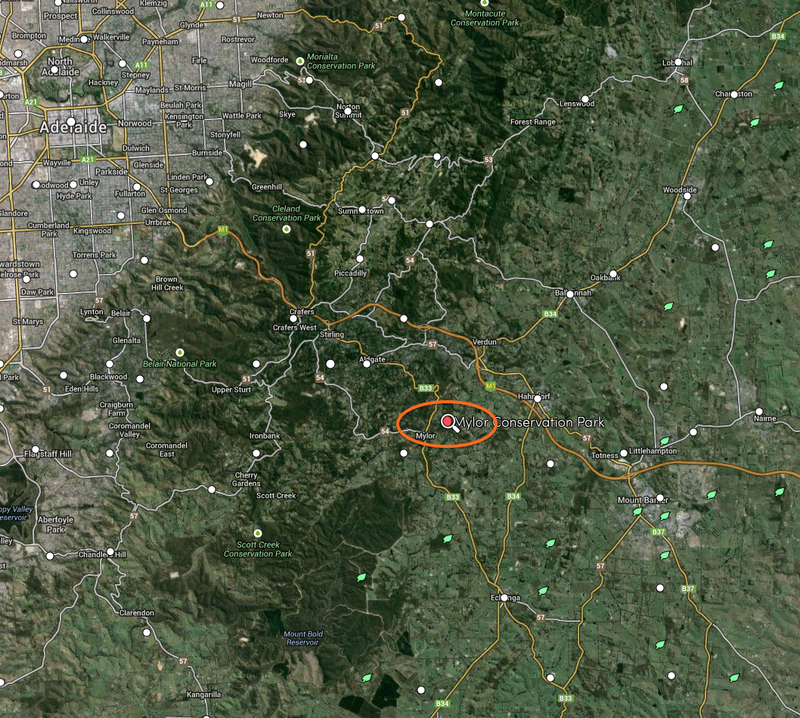 For whatever reason, the noise on 20m was a little higher than normal at Mount Lofty. I also saw a spot for Allan GW4VPX, but he too was just too weak for me to work. This was very frustrating. I then moved to 14.315 and put out a CQ call. I was greeted by Borek, OK1SDE in the Czech Republic with a nice strong 5/9 signal. I went to log Borek, only to find that in my haste to get to the 2nd operating spot, I had left my watch back at the original operating spot. Strike four, if you can have such a thing! So I was forced to use my i-phone to check the time. This was to cause me problems later as well, with my phone going flat. Five QSOs later I was thrilled to receive a call from Barry, M0IML who was portable on SOTA peak, Detling Hill, G/ SE-013. Barry was not as strong as Mike, but was still a good 5/4 to Mount Lofty. His signal had come up considerably from when I first heard him. I received a 5/5 signal report from Barry who was one of the activators I was hoping to log during the afternoon. This was followed by a contact with Hans DL6UHA, who informed me that I was his 1st ever VK summit. This was followed by contacts into the USA, Belgium and VK1. My next contact was with Martin OE5REO who was portable on SOTA peak, Grillenparz, OE/ OO-316. Martin’s signal was a bit low (5/3), but as the noise floor was much lower here, I was able to hear Martin without too many difficulties. I received a 5/5 signal report from Martin. Martin was using just 10 watts into an inverted vee dipole. This contact was immediately followed by a call from Erwin, OE5PEN, who was portable on SOTA peak, Kaiblinger Kogel, OE/ OO-325. Erwin’s signal was stronger than Martin’s. Erwin was a good 5/7 and I received a 5/7 signal report back from Erwin. I was absolutely thrilled to now have four S2S contacts in the log. 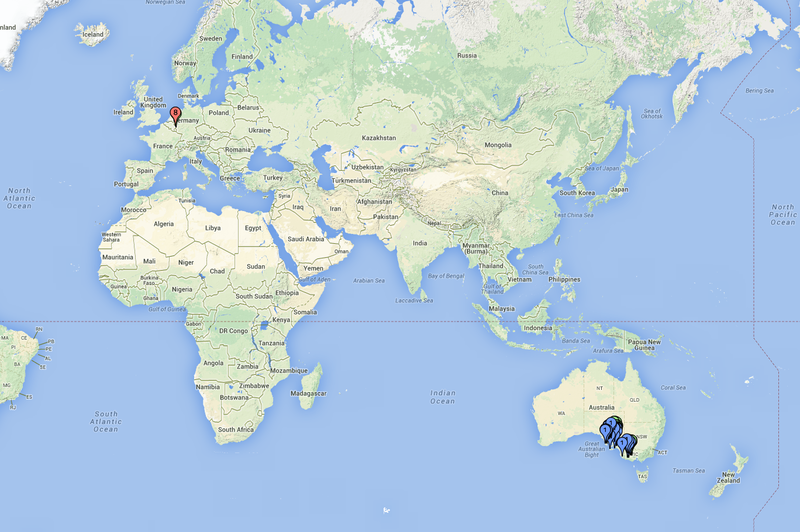 I continued to work a steady flow of callers, including John VK6NU in Western Australia, and Ed DD5LP in Germany. However, the band was a little noisier than usual, and I found that signals were either very good or extremely low. I had enormous problems with one station, G0XQX or similar, who sadly I just couldn’t pull out of the noise. And there were lots of other stations who I know were calling, but I was just unable to receive well enough to copy. I was pleased to make contact with Kurt, ON3VHK, who was operating portable with 50 watts, from his camper van. I was also Kurt’s first ever VK contact. Kurst has sent me some photos (as seen below) of his operating set up. John VK5BJE and his wife Jenny then arrived. I had spoken with John a bit earlier in the day and informed him of my intentions to activate the summit and the park, and I had invited him to join me if he was free. They had even brought along an iced coffee for me. So the ever keen, John took control of the mic and made some contacts, while Jenny and I returned to my original operating spot and retrieved my watch. There it was, in the spot that I had left it. At least I was out of a bit of trouble when I got home! After returning to John, Jenny and I and a bit of a chat. 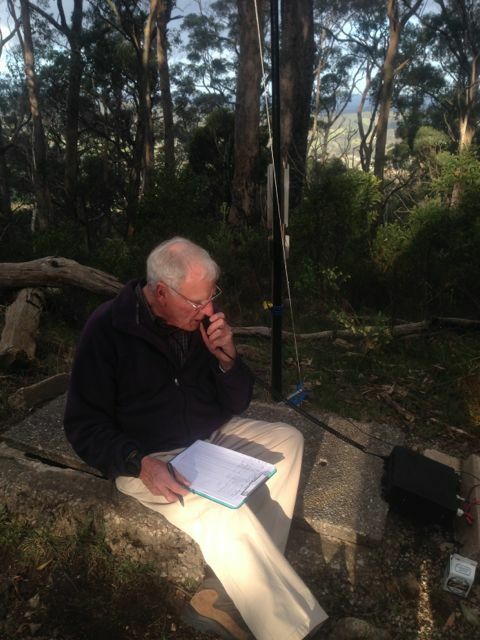 Out of one ear I heard John being called by Andrew VK1NAM who was on SOTA peak, Mount Stromlo, VK1/ AC-043. After John had logged Andrew, I also spoke with Andrew who had a beautiful 5/9 plus signal coming in from the Australian Capital Territory. Andrew had called me on 20m earlier but it was a real struggle to try to make the contact. Unfortunately we were not helped by the European chasers who were trying to relay at the time. But there were certainly no issues here on 40m with hearing Andrew. John continued on, and a few callers later was called by another Andrew. This time, Andrew VK1MBE who was on SOTA peak, Mount Ainslee VK1/ AC-040. I also logged Andrew, who again had a fantastic 5/9 plus signal. John and I then took a break from the radio and the three of us chatted for a while. Whilst doing so, keeping a watchful eye on a big koala that had placed himself in a very precarious position on the limb of a gum tree, about 30 metres away from us. It was a long way down to the ground, and we were waiting for the sound of the limb snapping under his weight. Fortunately this didn’t occur. John and Jenny then headed off home to the warmth. It was now approaching 5.30 p.m. and I toyed with the idea of whether I should stay or head home as well. But my eagerness took control, and I put out another call on 40m to be greeted by Brian VK3MCD. Lamont ZL2ALK then called in with a very good 5/9 plus 10 db signal. This was followed by Julie VK3FOWL, Mark VK7FMPR, and Joe VK3YSP. I decided to head back to 20m and see if the long path to Europe was still open. And I am pleased I did. Despite the fact it was getting a bit late, and starting to get dark, the 20m band appeared to have improved, with some very strong signals coming in from Europe and the United Kingdom. Those noise level appeared to have abated a little. As I tuned across the band, I heard John, EA7/G1WUU calling CQ with no takers, so I gave him a call. John had a beautiful 5/9 signal and I received a 5/7 signal report back from England. John and I had a bit of a ‘chinwag’ for a while, before I wished him 73. I then decided to try my luck and call CQ on 14.201 mhz. 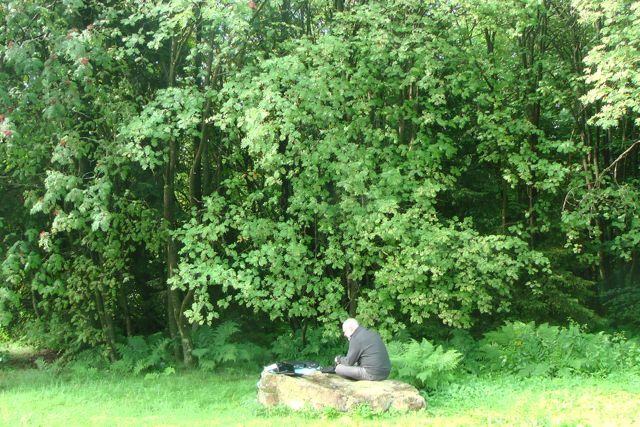 First taker was Tom G0LVX, followed by Bjoern DG2BHB and then Derek MI0SDR in Northern Ireland. Pat K4OAR from North Carolina then called me, and this was followed by Chris, N1GHZ/KH6 portable in Hawaii. Oliver F4FSV then called, using just 5 watts and a dipole. Oliver had a nice steady 5/3 signal. A steady flow of callers continued from Europe, with very strong signals. I was a little surprised, as it was starting to get dark, and normally by now the 20m band had closed for me. So it was a real surprise to get a call from Sal, TI2SSO in Costa Rica (5/7 send and 5/5 received). Daylight now was rapidly fading, and it was starting to get very cold. But conditions were just too good to go QRT. I was having too much fun. 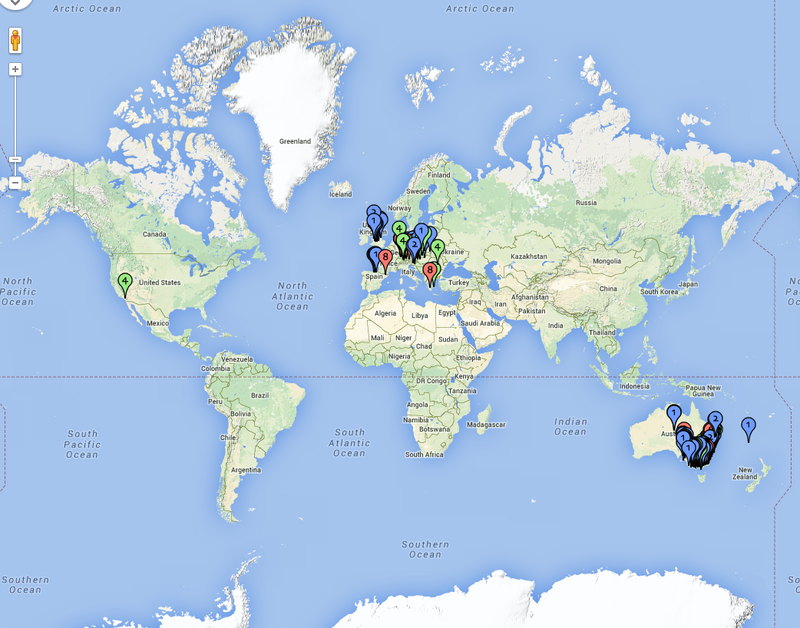 I continued to work a steady flow of callers from Belgium, Portugal, Italy, Scotland, France, Russia, and Spain. And I was then pleasantly surprised to receive a call from my old mate, Eddy ON6ZV. Eddy is mates with Marnix OP7M, who I had stayed with during my recent trip to Europe. Other than being an amateur, Eddy is also a police officer, like me. And we had spent a lot of time with Eddy and his wife Carine whilst we were in Belgium. So it was a real pleasure to have a chat to Eddy who was a good 5/8 signal. Eddy returned a 5/5 signal report to me. And then a further 6 QSOs down the log I received a call from Albert, ON2WAC, who I had also visited whilst I was in Belgium. Albert was a little weaker than Eddy, but still had a good 5/5 signal to Mount Lofty. Albert gave me a 5/7 signal report. It was now totally dark, and I had mountain bikers passing me with their lights on, going for a night ride. But the European stations kept calling with good signals, so I persevered despite the cold. I’m pleased I did, because the word must have got out in Belgium. I was called by Marnix OP7M with a very nice 5/7 signal, despite the fact that it was total darkness, and the local time was 6.53 p.m. Marnix even lowered his power down to 30 watts and I was still able to hear him well with a 5/4 signal. And then Wim ON7AB called in with a very strong 5/9 signal. I had also met Wim whilst in Belgium so I was particularly pleased with being able to make contact with Wim from Mount Lofty. Before I knew it, the time had crept up to 7.00 p.m. local time and I was now freezing. There were still some European stations calling, but I decided to head to 40m quickly and I joined Roy VK7ROY on the 7.130 DX Net. Whilst on the net, I made a total of 14 contacts including three into New Zealand, two into the United States of America, three into VK7, one into VK2, two into VK6, one into VK8, and two into VK3. My fingers had almost frozen over by this time and I informed Roy that I would be leaving the net, but that I would be on 7.145 for any last ‘desperadoes’ that would like Mount Lofty and Cleland CP in their log. I worked Terry VK3UP/p, Mark VK1EM, followed by Adrian VK4FBMW, Brian VK5FMID, and VK2FJ, before deciding that it was time to pack up and head home to a warm bath and a bottle of Cab Sav. I had a total of 104 contacts in the log. I was very satisfied. This was one of the best SOTA and park activations I had ever experienced, with some amazing conditions on 20m. Despite some hiccups, including a lost but recovered watch, and some very sore legs, I headed home with a real smile on my face. On Sunday 23rd November, 2014, a ‘Welcome to amateur radio’ symposium’ will be held at the Blackwood Community Centre, Young Street, Blackwood. The purpose of the day is to discuss the basics of the hobby of amateur radio. There will be 16 x short 20 minute presentations during the day, concluding in a general questions session. As you can see, there will be a presentation on the VK5 Parks award & World Wide Flora Fauna (WWFF) by Larry VK5LY. The cost of the day is $5.00 which includes morning & afternoon tea, and lunch which will consist of Subway and pizza. Doors open at 8.30 a.m. with a welcome by Tony VK5KAT at 8.45 followed by an introduction to the day by myself, and then the first presentation at 8.55 a.m. Please RSVP to me prior to Monday 17th Nov 2014, so that suitable catering & seating can be arranged. Either via email – simmopa@iprimus.com.au, or mobile – 0410 687 998. The day is designed to cater for ALL amateurs – NEW & OLD alike. Presenters will be travelling to the symposium from the Riverland and the mid north. **Please RSVP prior to Monday 17th Nov 2014. Unfortunately, at last years SOTA/parks symposium, some people just rolled up on the day. This caused issues with catering. So please RSVP to me. And also wear your call sign badge. I have placed a ‘flyer’ regarding the day in the Files section of both the VK5 Parks and WWFF group. 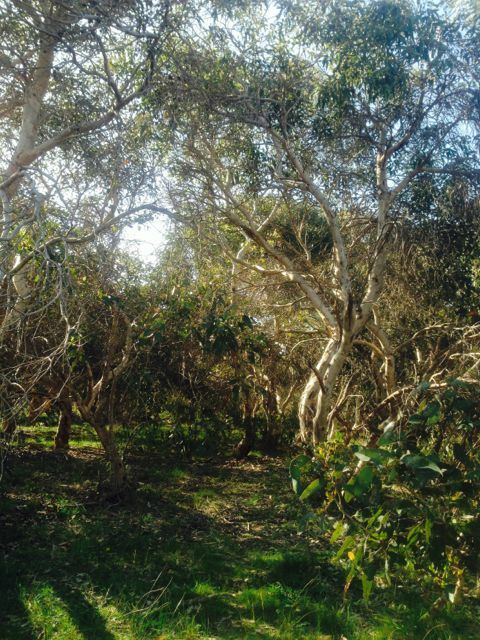 This afternoon, I travelled down to the Kyeema Conservation Park, which is located just off the road between Meadows and Willunga. 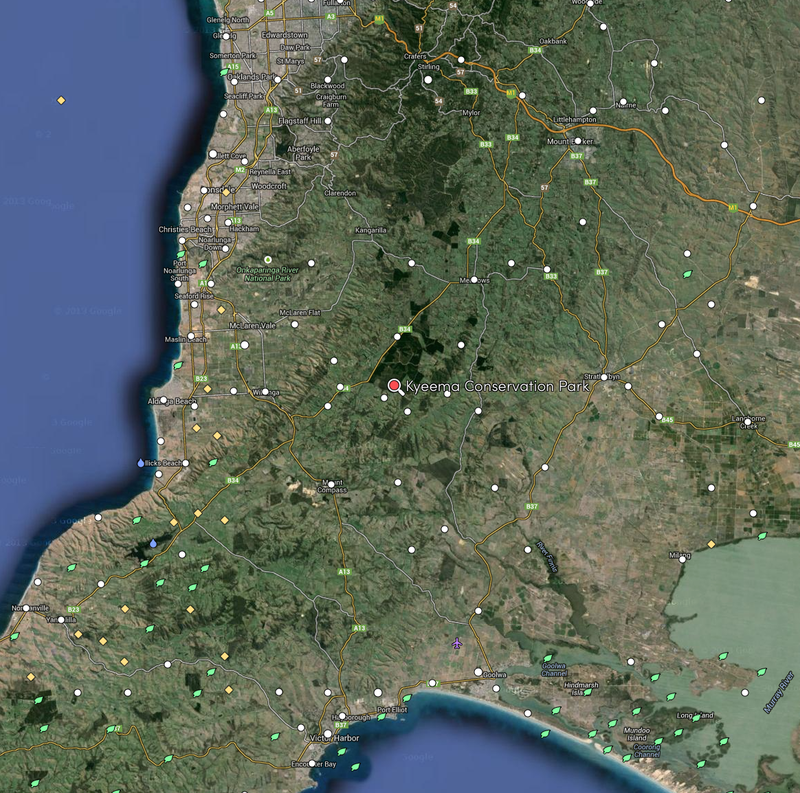 It is located about 60 km south east of the city of Adelaide. It is worth reading, as Kyeema has a very interesting history, including being a former labour prison reserve. The ‘prison reformation camp’ was established in 1932. A total of 11 names were suggested for the camp. Eventually, the Controller of Gaols and Prisons, E.H. Whittle, chose ‘Kyeema’, which in aboriginal means ‘dawn’. The name was chosen to associate the spirit of hope with the new movement. I managed to find a bit of shade as the afternoon sun had a bit of a bite to it. I set up my deck chair and fold up table under the shade of some gum trees. I used my Yaesu FT450, running about 60 watts, and my 40m/20m linked dipole, supported on a 7 m squid pole. The squid pole in turn was supported by a squid pole holder which I had driven into the ground. I started off calling CQ on 7.095 on 40m SSB and my first caller was Jaimie VK3TZE with a very strong 5/9 plus signal. This was followed by regular park ‘hunter’ Arno VK5ZAR and then Tim VK5AV from the South East. Both were 5/9 plus. It seemed the 40m band was in veery good shape again. The normal steady flow of park ‘hunters’ followed from VK1, VK2, VK3, VK5, and VK7. 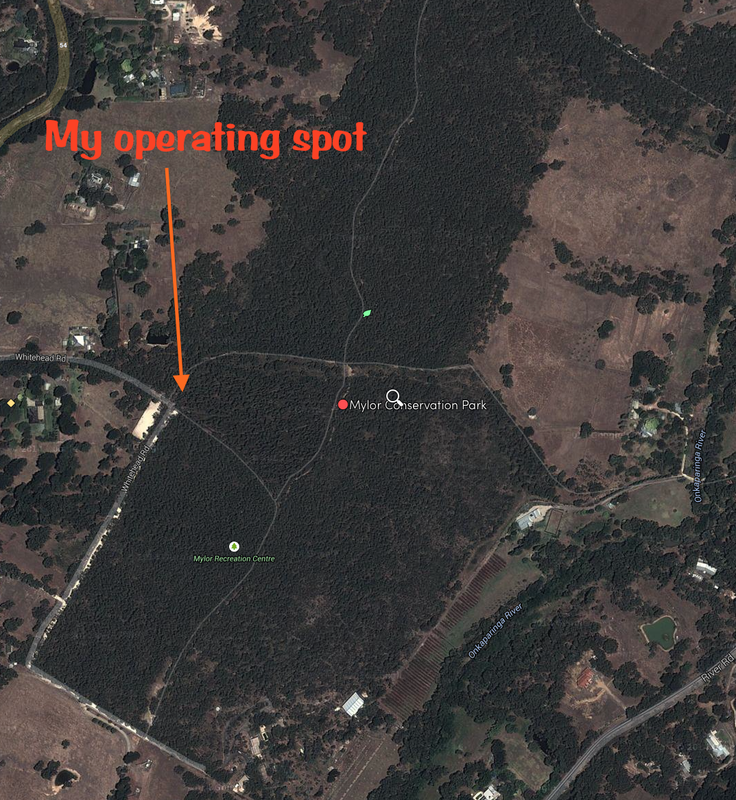 After operating for about 25 minutes, I was called by Steve VK5AIM, who was portable in the Kaiser Stuhl Conservation Park in the Barossa Valley. Steve was using an Icom IC703 and his ‘slinky squid’ antenna. Although his signal was down a little, I was still able to copy very well, as the noise floor in the park was negligible. It was great to hear someone else out in a park. And then, just 2 QSO’s down the track, I was called by Steve VK5SFA who was also out portable. Steve was operating from the Morialta Conservation Park, and had a very strong 5/9 plus signal. Another ‘park to park’ contact which was very pleasing. A further 2 QSOs on, I was called by Damien VK5FDEC, who was operating with Steve VK5AIM, in the Kaiser Stuhl Conservation Park. Damien’s signal was well over the 5/9 mark. This was Damien’s first every park activation. Welcome to the fold Damien. I am sure you will have a lot of fun. And with a signal like today’s, you will have no problems getting plenty of contacts in the log. And to top the day off, a few QSO’s later, I was called by Matt VK5MLB, who also had a very strong signal. Matt was operating from the Onkaparinga River National Park. This was also Matt’s first ever park activation. So welcome to you as well Matt. It was pleasing to get a few calls from QRP operators. This included Greg VK5GJ running just 5 watts from his home brew tx, Peter VK3TKK running just 2.5 watts, Wolf VK5WF running 4 watts into an inverted fee G5RV, Andrew VK3ARR running just 5 watts, Ian VK3VIN running QRP from his Argonaut, Robin VK5TN operating portable from his front yard, Erik VK3FMSC running 4 watts, and Peter VK3YE. Peter was running just 1 watt from a recently completed home brew tx. I was only his 2nd contact using his new home brew equipment. All had great signals. Things started to slow down a little, so I handed the frequency over to Steve VK5AIM. I then tuned across the band and found Lee VK3GK operating as VK9NT from Norfolk Island, calling CQ on 7.160. Only problem was, he was working split. How do I get the FT450 to operate split? After a couple of minutes, I had worked it out and gave Lee a call and got him in the log. I then tuned down and found avid park hunter, John VK5BJE talking with Matt VK5MLB. I quickly jumped in to tell John to head up the band after he had finished speaking with Matt. John is a really keen park ‘hunter’ so I didn’t want him to miss out on Kyeema CP. After working John, I was called by Terry VK3ASU who had just completed some antenna repairs, and this was followed by Ian VK5CZ with a huge signal from Clare. There were no more callers, so I lowered the antenna and took the links out of the dipole, so I could operate on 20m. However, as per yesterday, the 20m band was full of contesters for the Worked All Europe Contest. I couldn’t find a single station calling anything other than CQ Contest. So I headed down to 14.156 to say hello to the regular crew that operate on that frequency each day. I was lucky enough to make contact with John EA7BA in Spain, Ted G4TLY, Alan G0CRJ, and John M0CJW, all in England. And signal reports were quite good. I received a 5/9 from EA7BA, 5/8 from Ted, 5/6 from Alan, and 5/5 from John M0CJW. It was starting to get late in the afternoon, and I still wanted to go for a walk through the park, so I quickly tuned across the 20m band and worked Duncan EA5ON who was mobile at the marina at Valencia in Spain. Duncan had a very good signal and we had a very comfortable QSO. However this was my last contact on 20m for the day. I could not find anyone calling CQ. The only stations other than contesters that I heard were VK6IA and VK6ANC working Europe, and Jason ZL3JAS. So I decided to venture back quickly to 40m, and I am pleased I did. I managed to work the Chatham Islands DXpetition, ZL7X, who were operating split on 7.174. So after about 2 and 1/2 hours operating, I had worked a total of 46 stations, including some interesting DX. VK3TZE; VK5ZAR; VK5AV; VK3MRG/p; VK3ANL; VK5KLT; VK5GJ; VK5FMID; VK5IS; VK3AFW; VK5HCF; VK1MA; VK3TKK; VK5LY; VK2HHA; VK5AIM/p (Kaiser Stuhl CP); VK7NWT; VK5SFA/p (Morialta CP); VK5ZAT/m; VK5FDEC/p (Kaiser Stuhl CP); VK5WF; VK3ARR; VK5FTVR; VK2WGW; VK3VIN; VK5OB; VK5TN/p; VK3FMSC; VK5HS; VK5MLB/p (Onkaparinga River NP); VK5FTCT; VK3CM; VK3YE; VK5BW; VK3HRA; VK5TR; VK9NT (Norfolk Island); VK5BJE; VK3ASU; VK5CZ; EA7BA; G4TLY; G0CRJ; M0CJW; EA5ON/m; and ZL7X (Chatham Islands). Cockburn; R; ‘South Australia. What’s in a Name?, 2002. Yesterday afternoon I headed out to the Mylor Conservation Park (CP), which is just a short distance from home. The afternoon was just too beautiful to be sitting at home. Not a cloud in the clear blue sky and a temperature of 21 deg C. I had activated Mylor Conservation Park in September last year, so this was another 1 point to add to my activator tally. It is a beautiful drive from my home to the park. I travelled through the little town of Echunga, where I lived a number of years ago, and then on towards Mylor along the Strathalbyn Road. The countryside is lush and green, a contrast to the aerial photographs above. I then drove in to the little town of Mylor, which has a population of less than 1,000 people. Mylor is sometimes referred to on some maps as Warrakilla Hill. During the 1800’s, ‘Warrakilla’ was the name given by George Woodroffe Goyder to his estate and homestead in the vicinity. Goyder was South Australia’s Surveyor-General and it was he who suggested some relatively flat ground in the area as a town site. This was at a time when service centres were needed to support the new workingmen’s blocks. Mylor was proclaimed in 1891 by Acting Governor Sir James Boucaut, who named it after his Cornish birthplace. 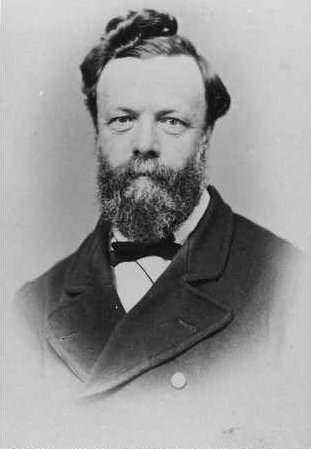 Above: – Surveyor General Goyder. Photo courtesy of wikipedia. The village of Mylor was effectively a replacement for a little community which had informally developed on a property named Rockford. Mylor thus gained instant substance as established businesses transferred to the new location and it quickly provided supplies and services. Some settlers formed a co-operative store, while others handled anything from bread to bookmaking. This co-operative store still stands today. Some churches and a school were subsequently established, but not a hotel. A fact that remains to this day. The nearest hotel is at either Echunga or Bridgewater. So no watering stop for me! Apparently every attempt to establish a hotel in the area during the late 1800’s was frowned upon by the temperance-minded Methodists. 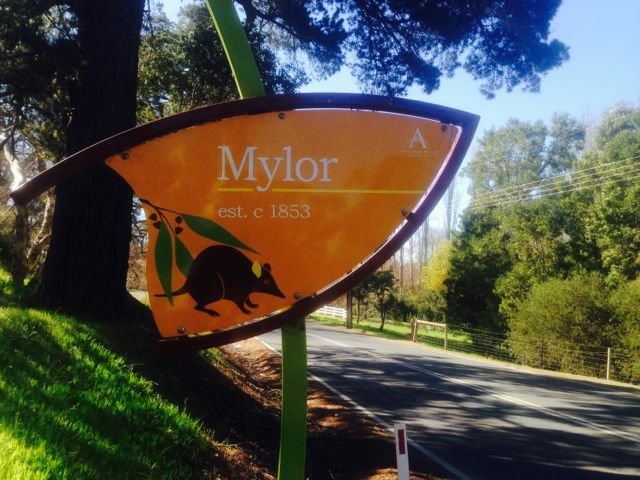 Mylor CP is located about 15 km south east of Adelaide and contains remnant bushland of the Mount Lofty Ranges. Most of the surrounding land has been cleared for residential and agricultural use. 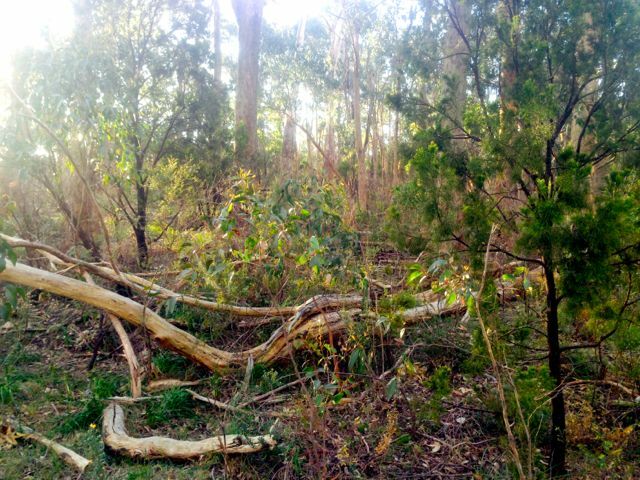 A section of the famous Heysen trail runs through the park, and two fully laden bushwalkers walked passed my location whilst I was operating. I set up in the same spot as last year, which was at the end of Whitehead Road, which runs off the Strathalbyn Road. There is a small car park here and it is a short walk of just a few metres to the entrance gate to the park. Again, as per last year, I used the boundary fence as a securing point for my 7 metre squid pole and 40m/20m linked dipole. I set up my fold up table and deck chair just off the path which runs alongside the western boundary of the park. There are beautiful shady gums here, so I was out of the afternoon sun. As per my recent park activations, I operated with the Yaesu FT-450 and ran about 60 watts output power. The power source was my 44 amp hour power pack. 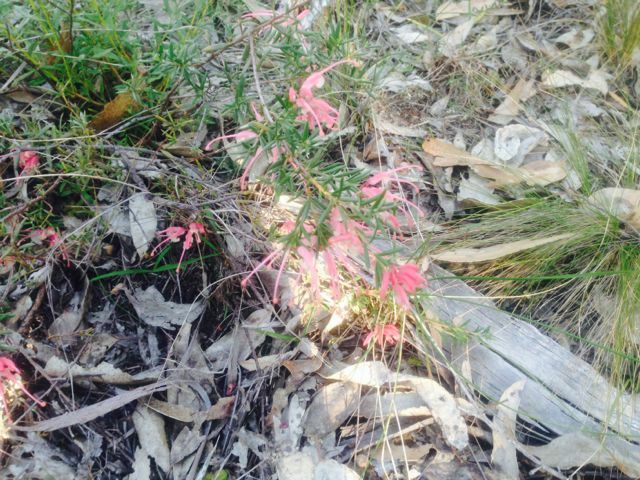 As we are going into warmer weather, many of the native plants were in flower, including the grevillias and wattle. But the warm weather, also meant snakes. The park si well known for its Eastern brown snakes, so I kept an ever vigilant watch. Fortunately none were seen. Prior to putting out a CQ call, I tuned across the band and found Tony VK3CAT who was portable on a Summits on the Air (SOTA) peak, Mount Donna Buang, VK3/ VC-002. Tony had a very good 5/9 signal coming into the Adelaide Hills. After working Tony, I ventured up to 7.095 which was the frequency I had posted on the VK5 Parks Yahoo group, I would activate from. But it was in use, so I moved down to 7.085 and started calling CQ. It wasn’t long before the steady flow of park ‘hunters’ commenced. First taker was Barry VK5BW, just up the road at Bridgewater. Barry’s signal almost knocked the FT-450 off the table. This was followed by Brian VK5FMID down in the South-East, who also had a strong 5/9 signal. I was then pleasantly surprised to get a call from Gordon VK5GY who was operating portable from the Cox Scrub Conservation Park. Gordon also had a good strong 5/9 signal. It was great to get a ‘park to park’ contact in the log. 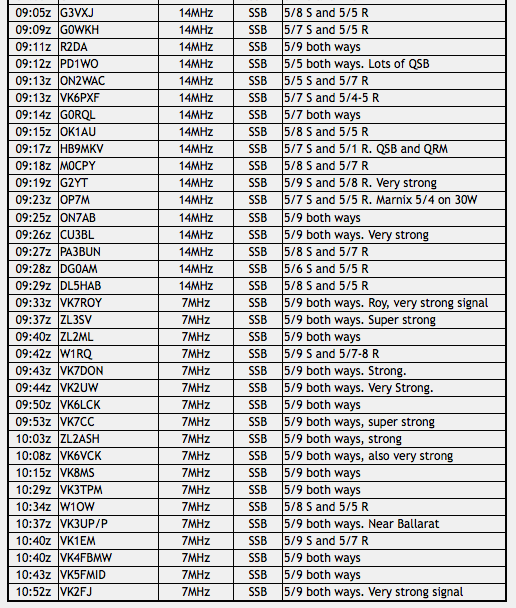 The signals on 40m were excellent. Almost all stations that I worked were well over the S9 mark. Some in fact were reaching 30 db – 40 db over strength 9. The noise floor within this park is non existent, so I was even able to hear some very weak signals including Bob VK5FO and Ray VK5RR, who were both mobile. After working a number of stations on 40m, I ventured over to 20m but found that the Worked All Europe contest was in full swing, so I did not hear many European stations calling anything but ‘CQ Contest’. 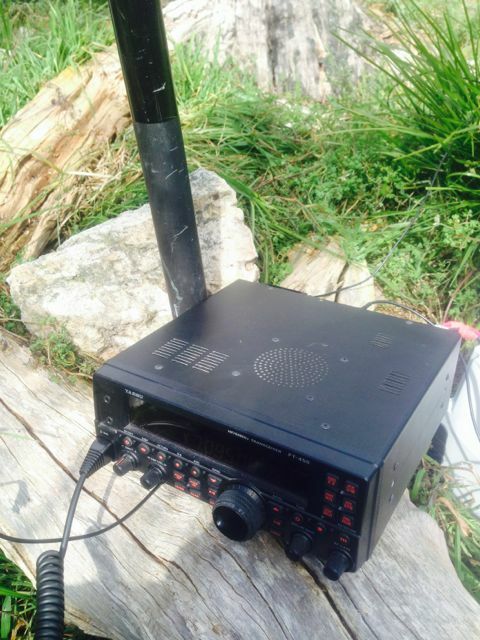 However I did find Nardo EC1DD who was portable on SOTA peak, Gabineira, EA1/PO-015. I called a number of times, before getting through to him. 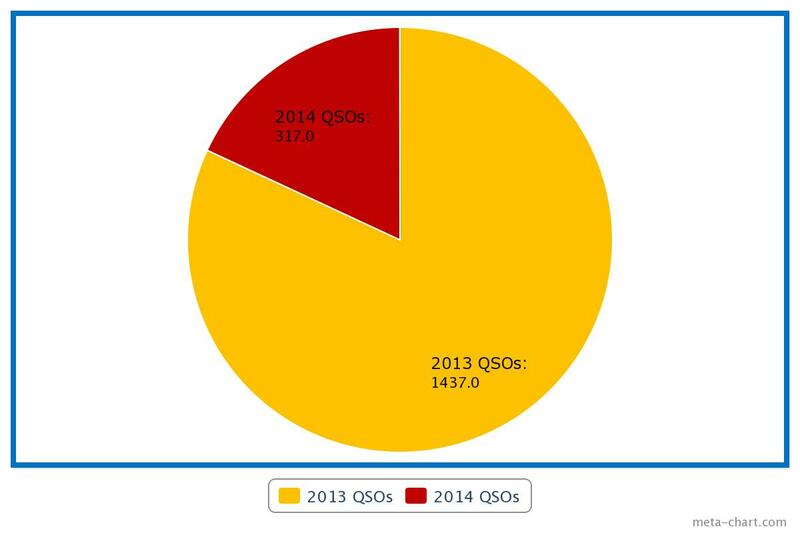 I was competing with a lot of European SOTA chasers and lots of QRM from the contesters. Nardo was 5/5 and I received a 5/9 signal report. I kept tuning across the band, hoping to find a station wanting to work some DX, and stumbled across Jo LX/PA9JO, amongst the contesters. Marija and I were heading out for tea, so it was time to pack up and head home so I didn’t get into strife. But whilst I was taking down the linked dipole, the i-phone bleated and I saw that Scott, VK2SWD was on a SOTA peak in New South Wales, VK2/ SM-053. I couldn’t help myself. Despite the squid pole being lowered and the dipole being very close to the ground, I put back in the crocodile clips for 40m and gave Scott a call and managed to get him in the log. Matt VK1MA asked me to QSY up 5, and I had my last QSO with Matt before going QRT. So after about 2 hours in the park, I had a total of 49 QSO’s in the log, with the majority of those being on 40m SSB. A fun afternoon in the sun. Thanks to everyone that called in. 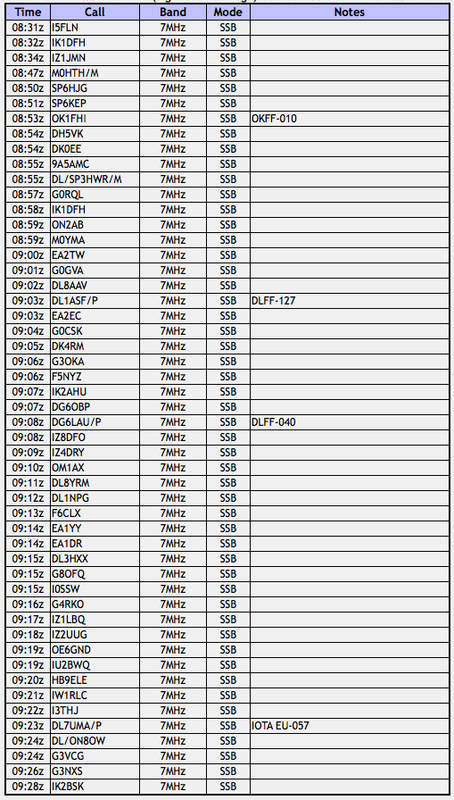 VK3CAT/p (SOTA), VK5BW, VK5FMID, VK5GY/p (Cox Scub CP), VK5NIG, VK2NEO/m, VK5VRB, VK5GJ, VK5TR, VK3FQSO, VK5ZAR, VK5NJ, VK5FTCT, VK3AXF, VK5HCF, VK5LY, VK1NAM, VK3PI, VK1EM/m, VK7TW/p, VK5FTVR, VK3OB, VK5FTRG, VK2FV, VK5FBAC, VK5TN, VK5XY, VK5RR/m, VK2HHA, VK3XP, VK3MCX, VK5FGRY, VK7FMPR, VK5VH, VK5AW, VK2LAW, VK4XAC, VK3FIAN, VK5HS, VK3JP, VK3ARR, VK2NNN, VK5FO/m, VK3MRG, VK5WG, EC1DD/p (SOTA), LX/PA9JO, VK2SWD/p (SOTA), and VK1MA. So I am just 1 association off reaching the SOTA Bronze Mountain Hunter certificate. 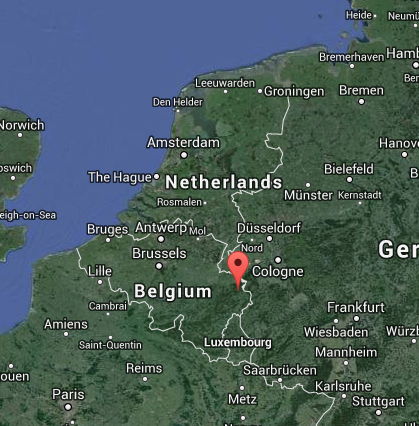 I was fortunate to activate a German summit and a Belgium summit during my recent trip to Europe. Many thanks to my good mates Marnix OP7M and Eddy ON6ZV. I managed 51 contacts from each of those summits, which were also in World Wide Flora and Fauna (WWFF) areas. In 2013 I journeyed over to Victoria and activated 11 summits with a total of 374 contacts. I have activated a total of 50 unique SOTA peaks around the world. 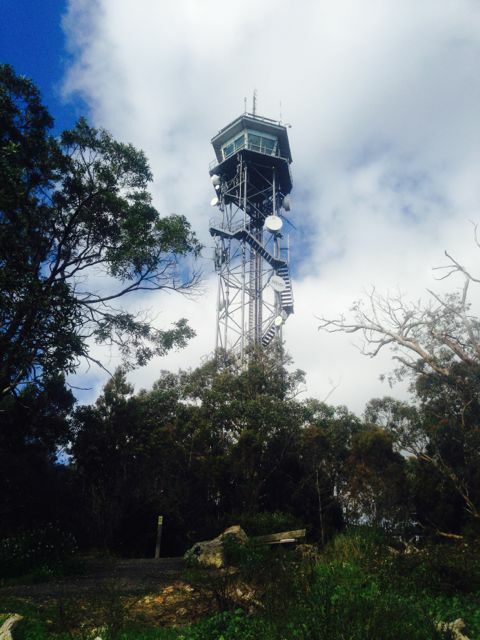 My most regular activated summit is Mount Lofty, VK5/ SE-005. 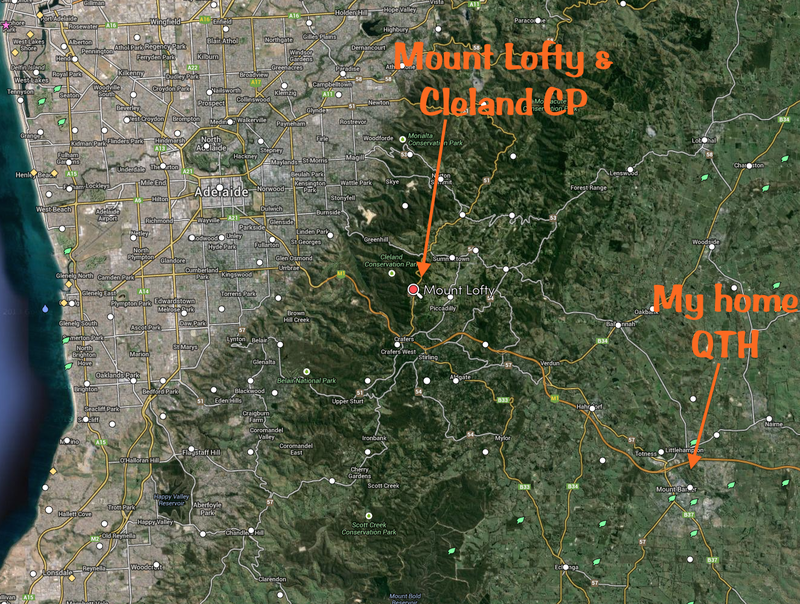 Not surprising, considering Mount Lofty is just 15 km to the west of my home. This is followed by Mount Gawler, VK5/ SE-013, which is also close to my home. Mount Gawler is inaccurately recorded as Mount Gowley with GMA. My most regular chaser is Peter VK3PF with 38 contacts, closely followed by Ernie VK3DET with 37 contacts, and then Peter VK3FPSR with 33 contacts. Brian VK5FMID comes in at number four, followed by Col VK5HCF. A total of 620 different operators have made contact with me whilst I have been on a summit. Once you have logged in to the GMA site, and you click on ‘Activator Log’ in the left hand column, you can view your activator progress. You can either select specific years or all of your activator history. There is a ‘Rate’ column where you can rate a summit for its access, etc. There is also a ‘WWFF mailed’ column. Here, with the click of a button, you can mail your log to the relevant World Wide Flora and Fauna (WWFF) co-ordinator, should your SOTA activation have been within a WWFF area. You can see from the image below, that as I have previously mentioned, the GMA points system is different to that of SOTA. Mount Lofty for example, is worth 7 GMA points, but only 4 SOTA points. Bonus points are issued for activations ‘during the months of November, December, January and February’. Each activation is awarded an additional 3 winter bonus points. Clearly these months are not winter months in Australia. It is our spring time and summer time. I have pointed this out to the GMA organisers. However, remember, GMA was originally for German activations. Just like the issue with the SOTA Database not considering us down here in Australia with the UTC roll over issues we have all experienced. In the colin marked ‘Rate’, you are able to rate a summit. Ratings are from 1 + bad to 5 + excellent. The rating involves ease of access, noise levels, etc. The green ‘i’ icon in the ‘cdx’ column indicates that there is information available from the DK0WCY aurora beacon during the time of the specified activation. This information includes the SFI, and the A and K indexes. 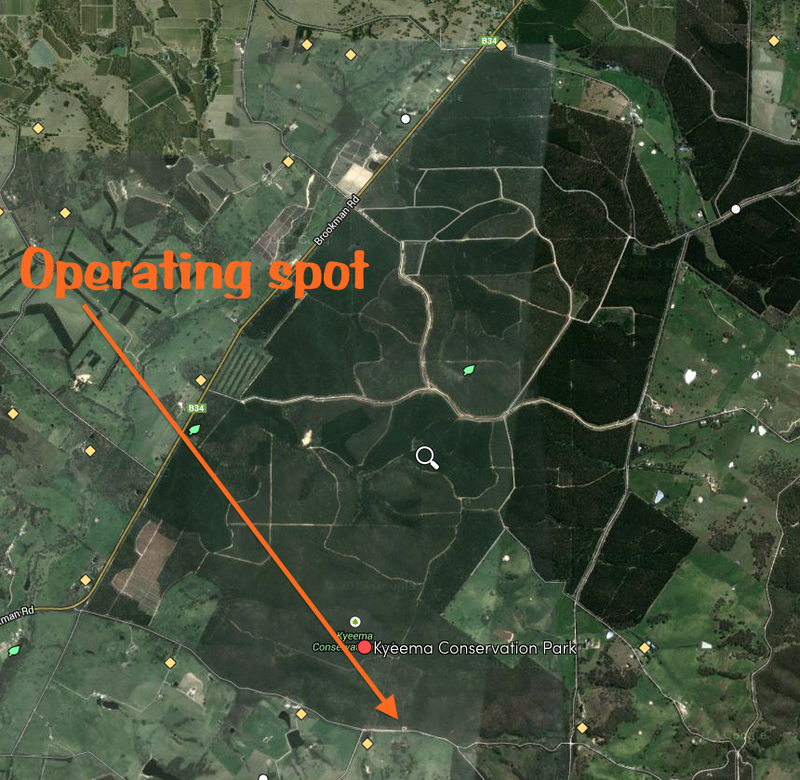 By clicking on the ‘red’ diamond in the ‘WWFF mailed’ column, your log will be automatically sent to the relevant WWFF co-ordinator, should our activation have been in a WWFF area. Unfortunately, my chaser statistics do not match with those recored on the SOTA database. The SOTA database shows that I have worked a total of 467 unique summits. 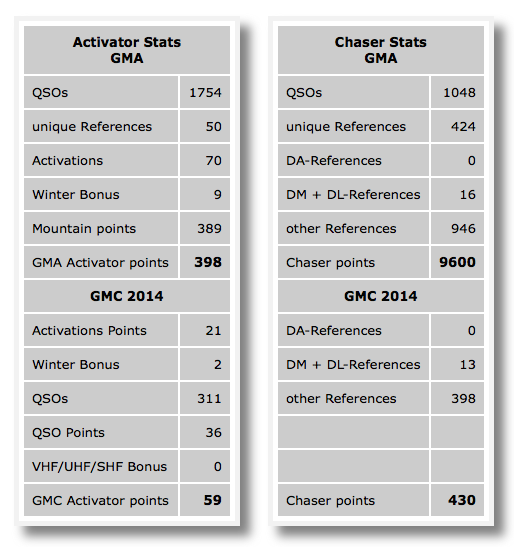 However the GMA database shows that I have chased a total of 424 unique summits. I will follow this up with the GMA co-ordinators as there have been prior issues with data that has been entered via GMA. 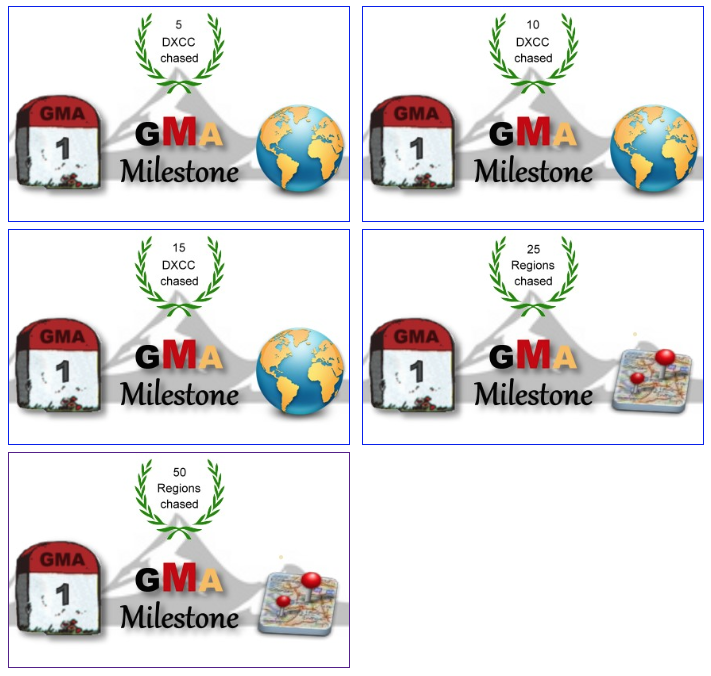 GMA also record your personal milestones: DXCC’s chased, Regions chased, Region hopper, and Globetrotter (you need 5 DXCC’s activated to qualify for this). Peter VK3PF is well known as a very keen SOTA and parks activator. 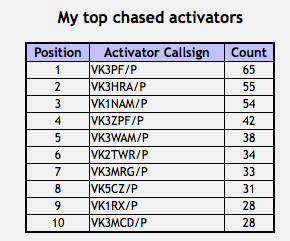 And this is reflected in my Top 25 chased Activators. Peter is ranked number 1, appearing in my logbook 65 times, followed by parksnpeaks author Allen VK3HRA on 52. In third place is another SOTA guru, Andrew VK1NAM on 50. 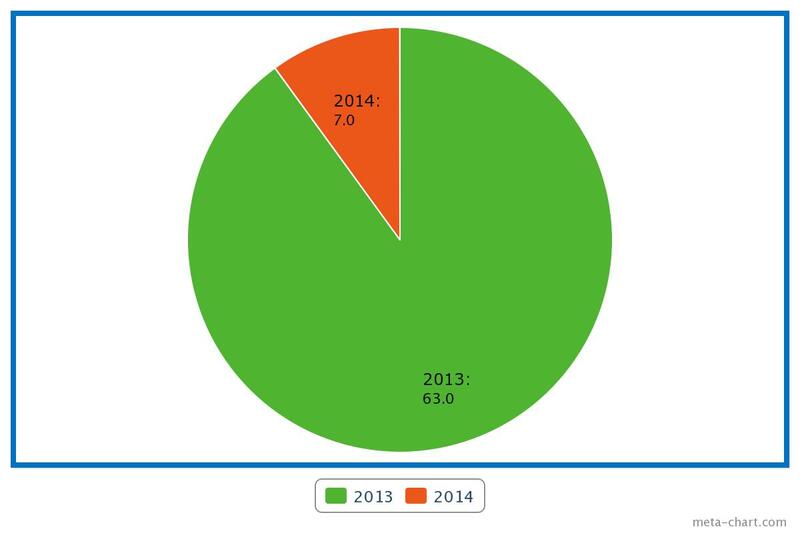 The above figures differ slightly to the SOTA database (as shown below). The GMA database does not show duplicates, e.g. a chaser working me twice on the same day. Thanks to a number of VK5’s, particularly Nigel VK5NIG, Mount Gawler VK5/ SE-013 is ranked number 1 in my Top 25 chased Summits. 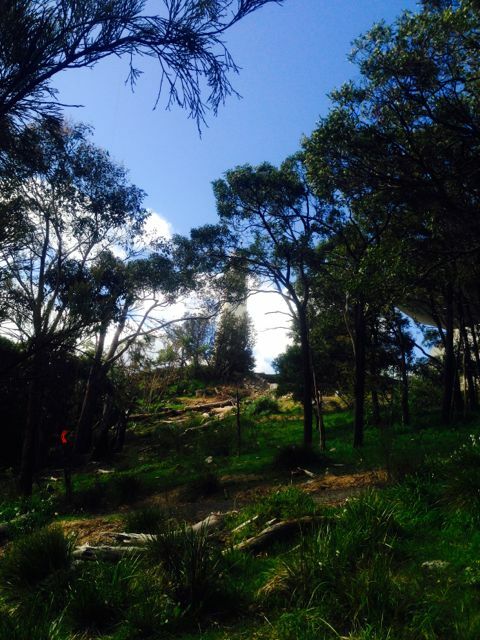 Mount Gawler is situated in the foothills of the north eastern suburbs of Adelaide and is very easily accessible. This is followed by Mount Taylor VK1/ AC-037, and in third place is Mount Donna Buang VK3/ VC-002. These figures differ slightly to the SOTA database. 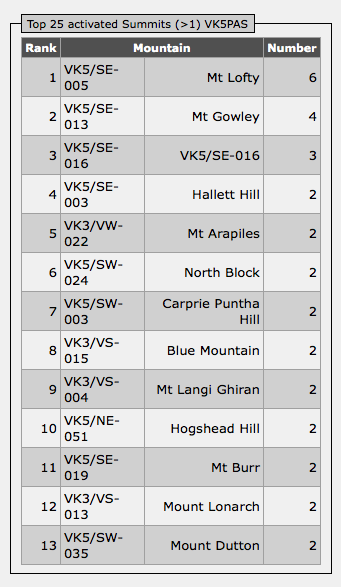 For example, the SOTA data base shows that I have worked Mount Gawler 32 times, not 28 as indicated by GMA. 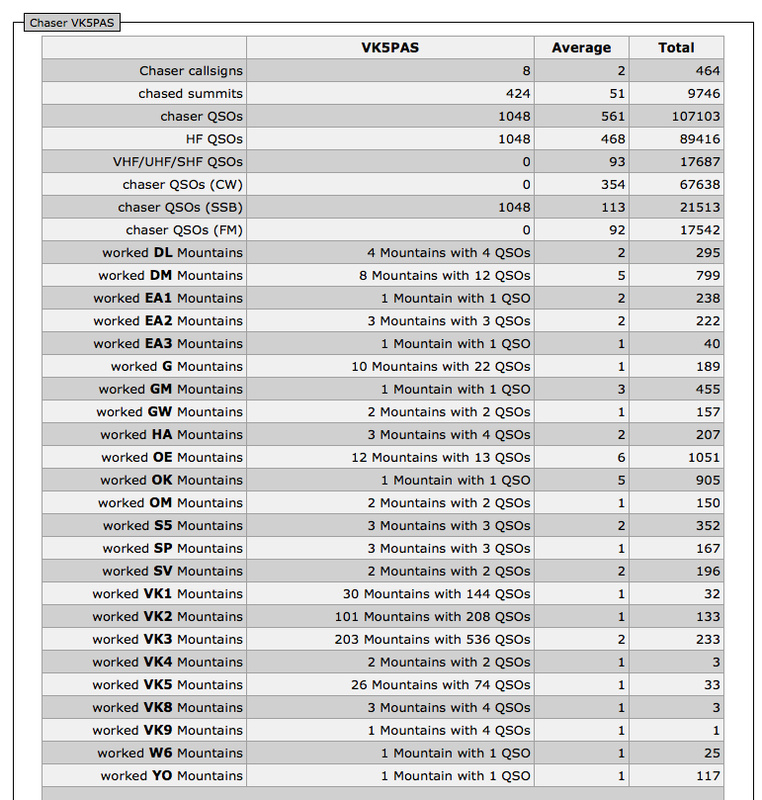 However, the GMA database only shows the 28 QSO’s where I have worked the summit for GMA points. The other 4 are dupes, e.g. worked this summit twice on the one day. 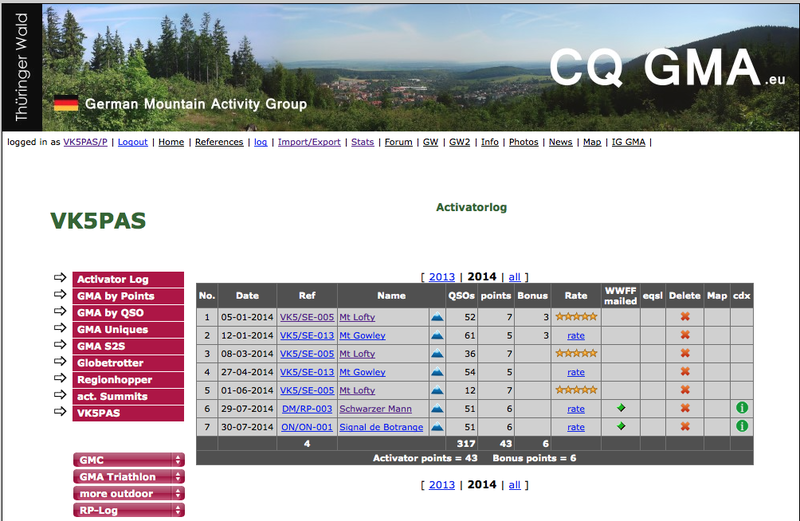 Here is the SOTA database figures…..
As per the activator feature, you can click on ‘wkd Summits’ in the left hand column, and this will bring up the Adventure Radio site and it will show all your worked summits on a map. So why not register for the GMA. It is free and easy. There are some very interesting statistics to be viewed. And you can earn yourself some more ‘wallpaper for the shack. I know that there has been previous discussion on the SOTA Australia Yahoo group as to what to sign when out portable, e.g. 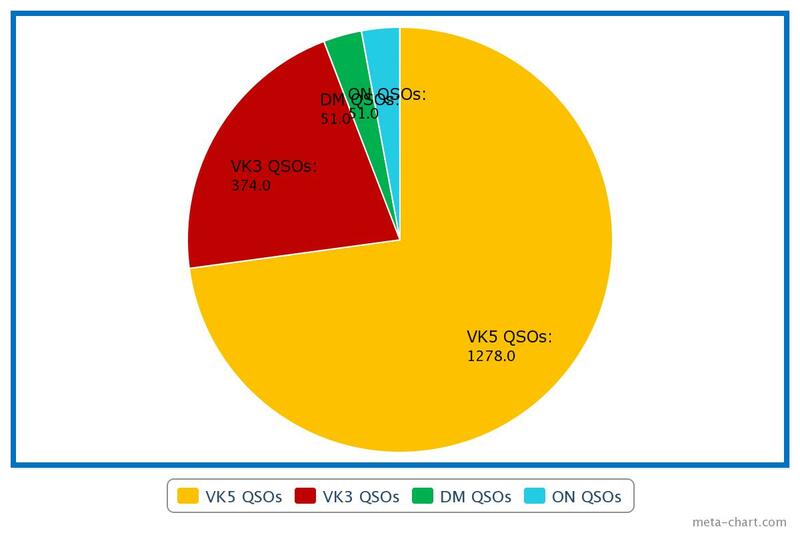 VK5PAS/p, or VK5PAS/3. However, I thought I would share a small problem I’ve been experiencing with my electronic log and Clublog. I run the logging program MacLogger DX and upload my log automatically to Clublog. I have been getting error messages back from Clublog regarding the pedestrian mobile and bicycle mobile stations that I have worked. Some have been signing as /pm or /bm. I have been recording them as /pm and /bm in my electronic log. However, Clublog deciphers /pm as Indonesia, and deciphers /bm as China. As a result of a post on the MacLogger DX Yahoo group, I received some very helpful responses. The upshot is that I need to record pedestrian or bicycle mobile stations as /p and not /pm or /bm. And simply place ‘pedestrian mobile’ or ‘bicycle mobile’ in the notes field of MacLogger DX. Clublog accepts /m for mobile, /mm for maritime mobile, and /am for aircraft mobile. Just for the information of anyone who uses MacLogger DX and Clublog. 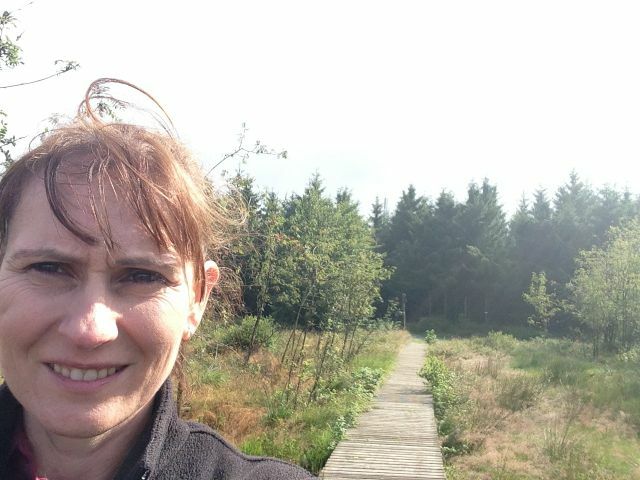 On Wednesday 30th July, we headed back over the German/Belgium border, into Belgium and activated Summits on the Air (SOTA) peak Signal de Botrange ON/ON-001 and World Wide Flora and Fauna (WWFF) area Hautes Fagnes-Eifel ONFF-001. 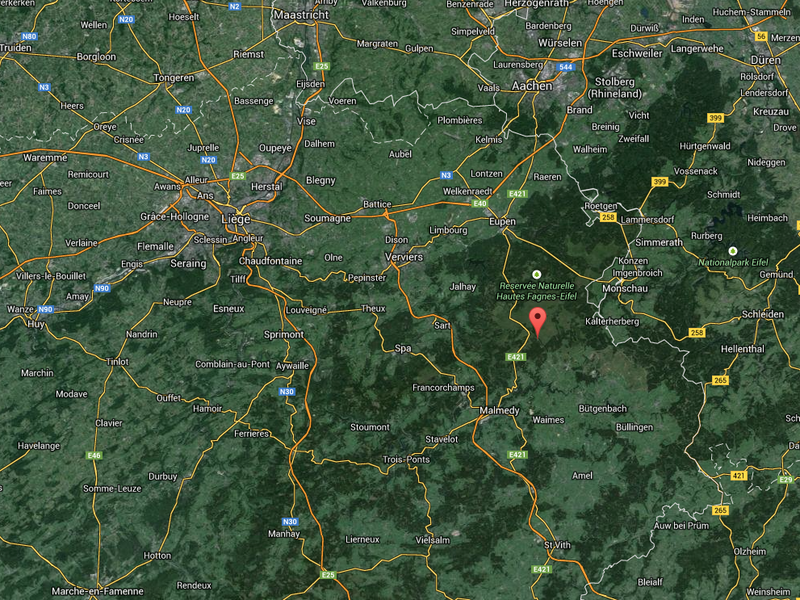 It was about a 90 minute drive from Prum through the mountains back into Belgium. The countryside was spectacular as we passed through a number of small villages. It was hard to believe that this was summer, as the landscape was so green. 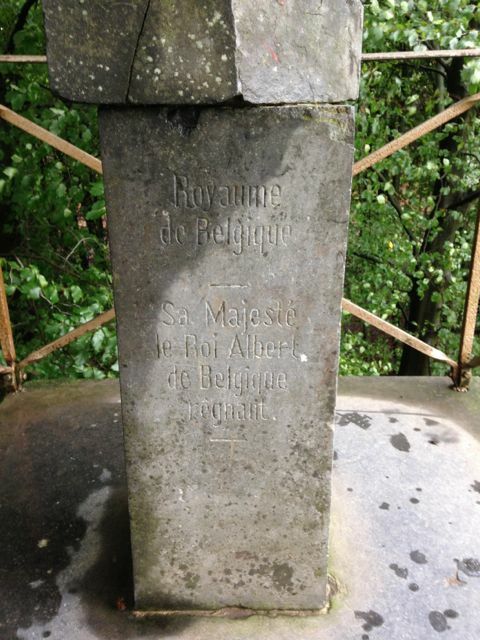 Signal de Botrange is the highest point in Belgium, climbing to 694 metres (2,277 feet). It is worth a total of 8 SOTA points and is located at the top of a broad plateau, and a road crosses the summit, passing an adjacent cafe. In 1923 a six metre high Baltia tower was built on the summit to allow visitors to reach an altitude of 700 metres. 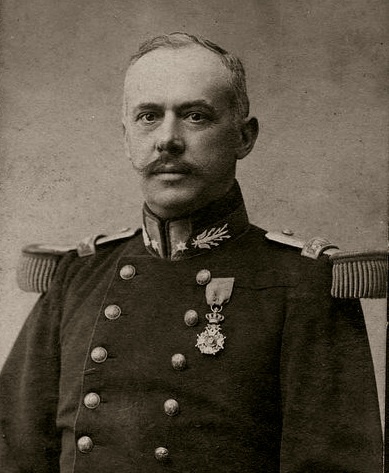 The tower was named after Baron Herman Baltia, a Belgian military officer (1863-1938). A stone tower was built in 1934 and this reaches 718 metres. Above: – Baron Herman Baltia. Photo courtesy of wikipedia. 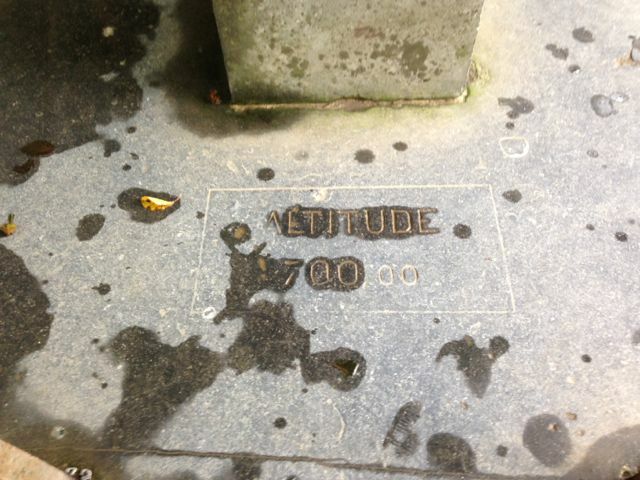 A meteorological station was located at the summit for many years, but in 1999, it was replaced by a nearby automatic station of the Royal Meteorological Institute of Belgium. The summit experiences extreme temperatures and these are usually lower than at any other place in Belgium. Fortunately on the day of our activation, the weather was overcast but fine. The summit is located within the Hautes Fagnes (High Fens) covers 12 municipalities of Belgium and was established in 1957. It is the largest nature reserve in Belgium, with an area of 4,501.2 hectares (11,123 acres). In winter, the area becomes Belgium’s premier cross country ski resorts. We operated from the edge of the carpark and attached Eddy’s end fed antenna to the 9 metre squid pole which in turn was attached to a nearby post. Again for this activation we used the Kenwood TS-50. There was a nice large flat rock nearby which served well as an operating location. As we were close by to the main carpark for the nature park, there was a lot of traffic. I was surprised at how many visitors there were to the park, considering that it was a week day. We certainly did attract some odd looks as people arrived and prepared to head off for a walk into the park. Whilst I was operating my tolerant wife Marija went for a walk along the boardwalk at the rear of the cafe, and took some photos of the 700 m marker. The actual trig point is a short distance from here. I commenced on 40 metres and remained there for the duration of the activation. My first contact was with Luciano I5FLN, and this was followed by a steady flow of callers from Europe and the United Kingdom. Again, it was a little too late for propagation to Australia on 20 m. We had enjoyed a bit of a sleep in at the hotel and a nice breakfast, so we had just missed the window for long path propagation into Australia on 20 metres. Another very enjoyable activation. My second in Europe. 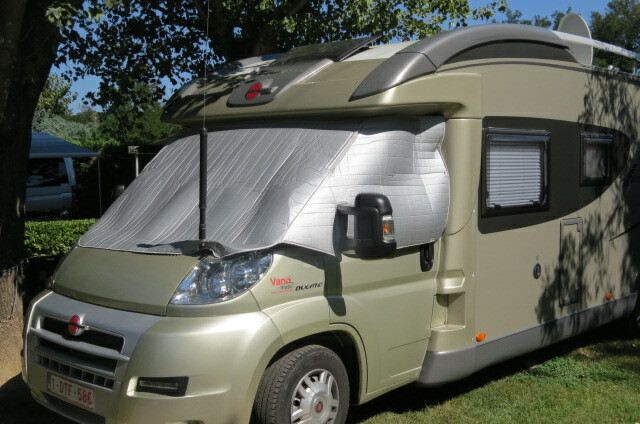 It was time to hit the road again, and journey north through Belgium back home to Ghent in northern Belgium. I would like to thank Marnix and Eddy for their time and effort in allowing me to activate the 2 summit/WWFF areas in Germany and Belgium. It was a hug he amount of fun.